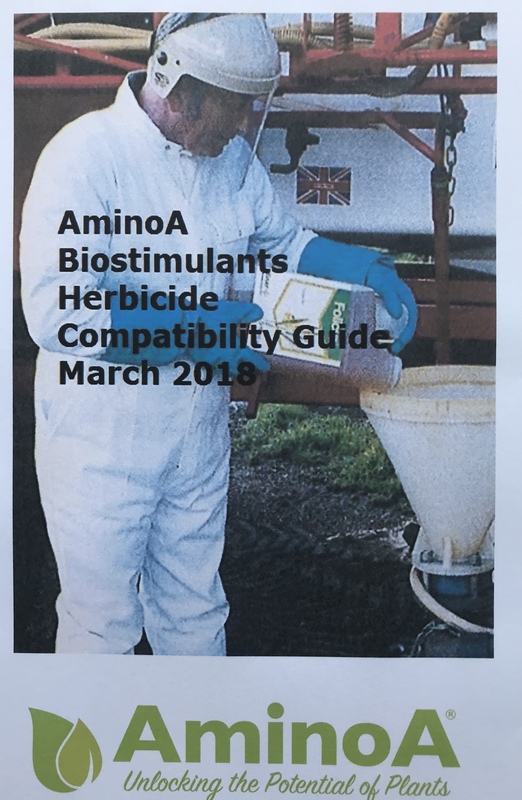 ( If this link does not open the document, please email enquiries@aminoa.co.uk and request a Herbicide Compatibility Guide). Tank mixing them with herbicides in the groups that we do not recommend, is unlikely to cause any crop damage, but weed control may be impaired, as our products are highly concentrated with biologically active, easily assimilated amino-acids, and the mode of action of these particular groups is to disrupt the natural amino-acid development chain in the target weed. We have demonstrated that our products applied to a plant immediately after the application of glyphosate can prevent it killing the treated plant! However, if you apply our products 5-7 days after a herbicide application of one of the products in the groups we do not recommend to TM with, you will enhance the weed kill and also give the crop a boost! ( But please read carefully and follow any manufacturers label recommendations as a priority). With fungicides and insecticides there should be no problems, unless there is some form of physical incompatibility, which is unlikely. With PGR’s, please be aware that the effect will be enhanced so don’t put high doses of PGR in with large doses of our products or you could end up with very short wheat. Trace elements, generally will be enhanced. In high temperatures ( over 25oC) do not apply with Boron, Sulphur or Copper. Be especially careful with Copper as high doses can cause defoliation! Work with Citrus growers in Florida, where they need to get high concentrations of cu into the leaf to control citrus canker, has demonstrated that the chelating effect of amino-acid product can improve uptake of Cu threefold. These notes are for guidance only and growers should always read and follow manufacturers label instructions. Tank Mixtures are made and applied at growers own risk.